Board index Facebook Fridays! - Free LMCCo Product Giveaways Every Week! 2018 Facebook Fridays! It's Facebook Fridays! for November 23, 2018! You can learn the magic of herbal remedies! The Lucky Mojo Curio Company is holding a random drawing to give away 4 enlightening and edifying spiritual supply prizes to enhance your knowledge of herbalism. 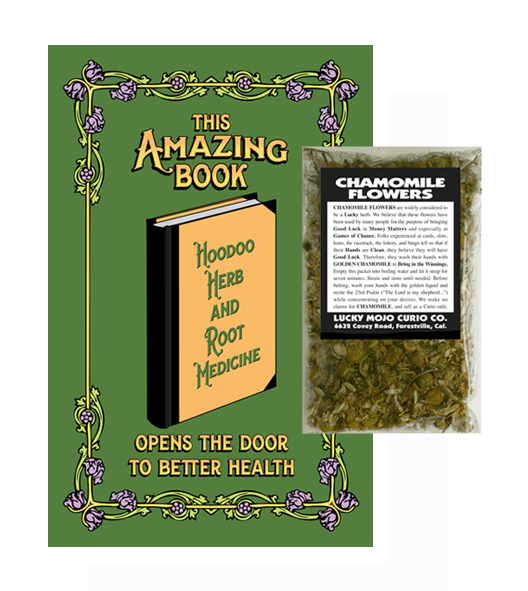 This week each lucky winner will receive a copy of "This Amazing Book: Hoodoo Herb and Root Medicine," a prescriptive compendium that has assisted rootworkers and healers for over 70 years. What's really great about this handy little volume is that in this revised and restored edition, every text entry and every illustration for a medical herb with a magical use in hoodoo is accurately cross-keyed to the corresponding page in cat yronwode's classic "Hoodoo Herb and Root Magic," making this a perfect supplement for the study of botanical conjure. Each winner will also receive a packet of Chamomile Flowers, a popular healing and magical herb with many uses. First thing tomorrow morning, we will select FOUR winners at random, announce their names here, and ask them to message the Lucky Mojo Facebook Page with their mailing addresses, so we can send them their FREE Amazing products. We have a winner! In fact, we have 4 lucky winners! Our Facebook Fridays! winners for November 11, 2018 are: Terence P Ward, Miranda N. Prather, Erin Nichole Handy, and Bunmi Kusimo. Thanks for participating in our contest. Watch this space for a new giveaway next Friday!